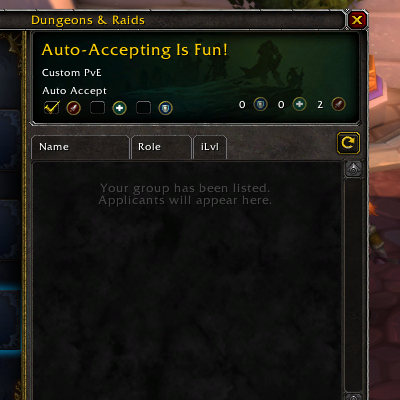 This simple add-on for World of Warcraft adds back in the auto-accept functionality that Blizzard removed from the premade group finder. It looks like the similar functionality that was available in other World Quest addons was also disabled so I'm guessing it's dead for good until someone gets creative. Requires a code change. Not sure what said code change is. Compare version 8.2 with 8.3 of WQL and you'll figure it out. Post here if you figure out what changed. WQL is nice for auto-accepting quests, but I use this to get Auto-Accept enabled in other categories than just Questing. Rather big late in this reply but I was researching why "premade group finder" addon wasn't working for me even though I knew about the changes in BFA pre-patch. It appears that blizzard did a change with their api with 8.1 or around its release that prevents preconfigured terms from searching. Yes I know that addons weren't allowed to search but that addon was capable of automatically finding your term the moment you opened/refreshed the group listings in the blizzard UI. I am not versed in lua, but per your recommendation I was tracking code changes between the 8.2 and 8.3 versions of WQL. Not my code and I am only pointing out this out as an example! "active, activityID, ilvl, honorLevel, name, comment, voiceChat, duration, autoAccept, privateGroup, lfg_questID" Most of that line got changed into just "data". Excluding the version change in the lua and the commit notes, there were 7 changes throughout the lua. Apparently the premise of the api change probably boils down to addons only being able to use something called Data. Cause I see it now littered everywhere in the 7 spots of code change. Maybe this is some additional protection done by blizzard, beyond preventing addons from being able to utilize the search fields? They can only use what game provides, rather than trolling from what they want to find? Overall a real sad change, and I am saddened to finally see at least on my end how an addon dev managed to retain functionality amid Blizzard's rampant undocumented api changes. i see the 3 checkboxes in the group finder now but when i switch characters it doesn't auto-accept me and they end up unchecking themselves am i doing something wrong or is it not made to be used in the way i want?